The Surrey Oaks has several separate bar areas including a pool room and a restaurant-like area. Parts of the building date from 1570 and there has been a pub here since 1850 when a widow decided to raise extra income by starting a pub. Good idea! 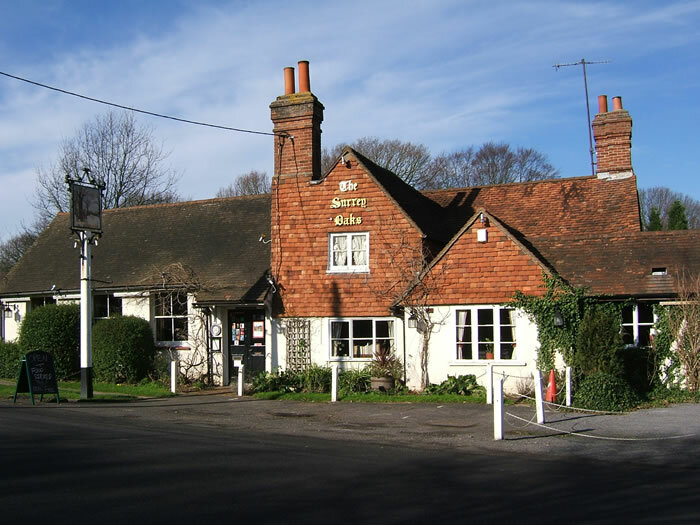 The pub usually serves Harveys Sussex Bitter and a local beer like Surrey Hills Ranmore Ale as well as three guest beers. The pub has won numerous awards from the local CAMRA group. There is a beer festival on May (Whitsun) and August bank holiday weekends. The pub has a boules pitch and an unusual pub sign with different pictures on each side. There is a large garden on one side of the pub. Here's a 2015 review of the Surrey Oaks by Rach Smith. Come out of the pub, turn left and cycle north along country lanes towards the village green at Brockham. or cycle back towards Rusper in a circular route via Charlwood. The new CAMRA Good Beer Guide for 2019. Find pubs with the best real ale. Essential reading!